This is a bell at Two Lovers Point in Guam. 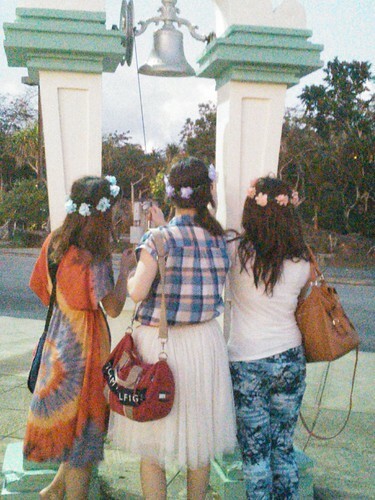 The management of this most popular iconic spot on the resort island of Guam are at least subconsciously aware that if you want Japanese tourists to come to your destination, then provide them with all the accoutrements of a pagan temple: a legend, something symbolic ideally natural, some good luck charms (locks), a place to leave votive offerings (the rails to leave love locks), a way of making non-linguistic noise either by clapping, or ideally by a bell (as pictured above), and an opportunity for autoscopy: a mirror or place to take a selfie. Tourism is secular pilgrimage.